Intro from Jay Allison: Anniversaries are for remembering. Of course, none of us have forgotten. So, heading into the flurry of remembrance that this anniversary is bound to bring, there is some hesitance–especially among the media whose charge is to broadly mete out the stories–over what we should say, and how much, and why. Here at Transom, we wanted something simple and unadorned that we hadn’t heard before, something that resembled a spoken history, at which radio excels, but which due to time and format constraints, often remains in archives. "All Available Boats" is a series of short narratives by those who worked the river on that day–ferry captains, fireboat engineers, tug crew members, private boaters–evacuating an estimated 300,000 people from the waterfront. The material was gathered by producer David Tarnow for the Southstreet Seaport Museum and we’re glad to give it a wider hearing. As David says, these people spoke with eagerness and reluctance, "eager to get the stories off their chests and reluctant to relive the horror of that day." That’s how many of us feel, I’m betting. We hope you will find this work both eloquent and quiet. “All Available Boats: Harbor Voices from 9/11” consists of a series of interviews with members of New York’s maritime community and it documents their response to the attack on the World Trade Center and their role in the subsequent evacuation of Lower Manhattan. Since the bridges, tunnels and subways were closed off, the water suddenly became the only way out. The Coast Guard enlisted all available boats to evacuate an army of walking wounded and terrified office workers and to bring rescuers and supplies onto the island. What emerges is the story of a collective effort of selfless dedication on the part of these previously invisible waterfront hands. These are the people who made this evacuation possible (perhaps the piece should be re-titled “Dunkirk on the Hudson”). The interviews were commissioned by the South Street Seaport Museum for a permanent archive documenting the event and they form the basis of an interactive exhibit currently on display. I worked very closely with South Street Seaport’s senior historian Steve Jaffe to make sure to show that the expertise, teamwork and ability to improvise under pressure were qualities practiced by these people in their daily working lives. Many of the interviewees had approached the Museum with written accounts and when it came down to it they were both eager and reluctant to talk. 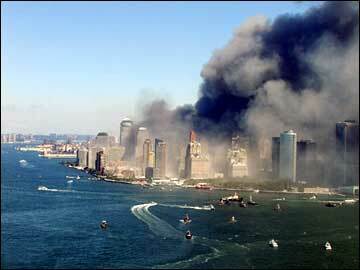 Eager to get the story off their chests and reluctant to having to relive the horror of that day. The retired New York City fireboat John J. Harvey helped in the evacuation and then helped supply water to fire department hoses at Ground Zero when water mains were knocked out. 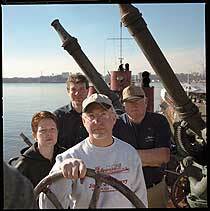 Harvey’s crew includes (from left) Jessica duLong, Tim Ivory, Huntley Gill and Robert Lenny. 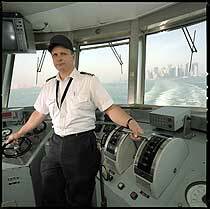 Island ferry captain James Parese witnessed the second plane as it crashed into the South Tower, then evacuated 6,000 people in one trip aboard his ferry, the Samuel I. Newhouse. David Tarnow has been producing radio documentaries since 1968. His work has been broadcast on CBC, BBC, ABC (Australia), Swedish National Radio & VPRO (Netherlands). He has been a regular contributor to NPR's "Jazz Profiles." Oral histories frequently form the basis of his work. David is currently producing an documentary audio book for the United Nations based on interviews with Nobel Peace Prize Laureates entitled "Nobel Voices for Disarmorment." Anniversaries are for remembering. Of course, none of us have forgotten. So, heading into the flurry of remembrance that this anniversary is bound to bring, there is some hesitance–especially among the media whose charge is to broadly mete out the stories–over what we should say, and how much, and why. Here at Transom, we wanted something simple and unadorned that we hadn’t heard before, something that resembled a spoken history, at which radio excels, but which due to time and format constraints, often remains in archives. "All Available Boats" is a series of short narratives by those who worked the river on that day–ferry captains, fireboat engineers, tug crew members, private boaters–evacuating an estimated 300,000 people from the waterfront. The material was gathered by producer David Tarnow for the Southstreet Seaport Museum and we’re glad to give it a wider hearing. As David says, these people spoke with eagerness and reluctance, "eager to get the stories off their chests and reluctant to relive the horror of that day." That’s how many of us feel, I’m betting. We hope you will find this work both eloquent and quiet. All Available Boats: Harbor Voices from 9/11 is a 30-minute documentary available to all public radio stations for special September 11th coverage. army of wounded and severely shaken office workers. This program uses first-person accounts to tell the story of some of the members of the maritime community who made that evacuation possible. To preview this documentary, go to the public radio website transom.org. Carriage rights: To air no more than three (3) times before October 1, 2002. John, let us know when you have an audio link to your version. It will be interesting to note the choices you and David made in creating a version for radio, and any production you added to the original spoken testimonies. recounted here. It must be hard to live with them sometimes; I did get a sense of the interviewees unburdening themselves, temporarily at least, through telling their stories. One thing that emerges from this work, for me anyway (apart from the whole enormity of these terrible events), is the incredible cooperation that was going on immediately following the planes hitting, in the midst of all the chaos; what a staggering feat of coordination and bravery between so many organisations and people. From an oral history point of view, that is an important legacy of this work. Could you talk about the interviewing, where were you, did you ask lots of questions, or did you just let them reveal their stories? I think the solitary voices (without interviewer), was appropriate, but at times I wanted a breather, some space to let the details settle in. Thanks for letting these people tell their stories; pardon the cliche, but it is when tragedy strikes that one is tested, and they came through that day, they deserve much more appreciation for their daily work than they no doubt get. Despite swimming against a tide of technical problems, we should have an audio version posted on our site by Saturday 9/7. At that time, I’ll be able to provide more thoughts on the work. I’ll encourage David Tarnow, who did a marvelous job, to do the same. I’ve got the link working, so you can hear the documentary version of All Available Boats"
I’ll leave the discussion of specific choices made to David, who put this together by scratch pretty much by himself. But I will say the larger choices we made were based on wanting to keep a narrative running, and placing the events in a timeline. To me, that’s what works so well in the 30-minute version – it’s a tale that you can feel being told from the beginning. It gave me a sense of being there. Also, while there’s undeniably very powerful personal stories here, I wasn’t interested in it being another "rememberance" piece. The very story of these people’s action seemed to be enough. Anyway, hope you enjoy it. And email me directly at jdankosky@wnpr.org with any questions. these inverviews are almost ambient in the way they wash over you — you listen, you pay attention, but you also float. maybe it’s their calmness amongst the panic. maybe, and i hope this isn’t too elemental, but maybe the intervus very much convey Water lapping the edges of Fire&Earth. these would be quite moving as an audio accompaniment to a photo exhibit (which may be how the museum is using them). The first time I heard these stories I was struck by the speakers’ composure – the calmness that Barrett spoke of. It sort of made me feel strange – I was expecting something more raw. (and I suppose I was expecting some "saltier" types – stereotypical I know, but there it is.) Months later, listening again, instead I am moved by the composure – it seems more fragile, more "held together" in the face of such disaster – and I can’t say why, it must be something utterly subjective, like the passing of my own inner time. David, how soon after Sept 11th did you do these interviews? Have you recuperated yet? It must have been emotionally exhausting both the taping and the cutting. Kudos. I just finished listening to the full documentary version. As the stories blended into one another, I lost track of time in my own bedroom. The narrative progression drew me forward in a way that made me want to go beyond listening. I learned not only *that* the workers on the boats helped, but also understood *why* they felt unquestionably compelled to give. The urgency is in their voices. The full piece is compelling in the way that it follows the events in the order that they progressed that day — from bewilderment, to the feeling that something was horribly wrong, to the need for calming care amidst fear. The Parese interview segues well between shock and determination. You can hear the sorrow behind his voice, but also drive to help. The technique of tying together interviewees via radio exchanges was especially effective. It provides an aural change of scene. I picture myself shooting over the radio waves to the next boat I’m hearing from. Because each interview is a short piece of time — each picking up at a different point in the events — it gives me the feeling that all of the workers on the boats are collaborating in parallel. If I didn’t have the photo at the top of this page, I might have a similar picture in my head. I always try to interview people in a quiet place where they feel most comfortable but in this instance that wasnt always possible. Many were interviewed in a back workshop room at the South Street Seaport Museum, some in their offices and two – Sullivan & Amico – in the wheelhouses of boats in the harbor (if you listen with headphones you can hear the waves). Before turning on the tape recorder I tried to judge the level of their nervousness and for the most apprehensive instead of diving immediately into the events" of the day, asked them to speak about their background first so we could get to know each other better and so they could find out that I was sincerely interested in what they had to say. I realize that I usually edit out my questions and create a monologue from the conversation except where it wont make sense. This is done intentionally in order to give the listener the feeling that the person is talking directly to them rather than speaking through an intermediary. I also try to pace the story out so there is time to assimilate the details. Thanks for your honest reaction. I’ll keep your observation in mind next time I’m editing an interview. I conducted the interviews during October and November of 2001, when the "events" were fresh in the minds of the interviewees. I think for many of them these were the first times they were asked to give a comprehensive accounting of what happened to them. In some cases you can actually hear people realizing things or remembering them as they spoke. Have I recovered? I don’t know. Last fall while I was interviewing these people I was so struck by the poignancy of their stories that it was hard for me to pay attention to anything else. During the editing I felt that I had a sacred trust to try to help these people to tell their stories as they had told them to me without any distortion. But as soon as you make one cut you change things. It’s a delemma. How to take a one hour conversation and turn it into a couple of segments a few minutes long each and still be faithful to the original spirit and content? All I did was to keep the interviewees in mind as my primary audience and try my best to portray them as they would like to be portrayed. I was glad when the ones who showed up for the opening of the exhibit said they thought I did a good job. I’ve gotten word that WKSU Cleveland will air "All Available Boats" on September 29th. They join WNPR and KAZU, which both aired the show as part of special 9/11 coverage. We’ve also been made a part of the Public Interactive special coverage page. No, we’ve not exactly reached the whole world, but thanks to transom.org, we’ve touched our little piece of it. Heard this on KERA 90.1 FM Dallas-Fort Worth TX) 9/11/11. Should have heard it sooner! Shallow water, deep water or under the sea, sailors will do what sailors have always done – what ever is required. “All Available Boats” left me proud of my fellow sailors. Good Job!